This article is about the county in the Minneapolis–Saint Paul metropolitan area. For the community in southeast Minnesota named Dakota, see Dakota, Minnesota. 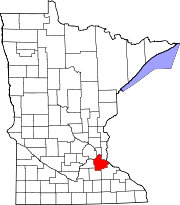 Dakota County is included in the Minneapolis–St. Paul–Bloomington, MN–WI Metropolitan Statistical Area, the sixteenth largest metropolitan area in the United States with about 3.3 million residents. The county is bordered by the Minnesota and Mississippi Rivers on the north, and the state of Wisconsin on the east. The county was the site of historical events at Mendota that defined the state's future, including providing materials for the construction of Fort Snelling across the river and the signing of the Treaty of Traverse des Sioux which ceded land from the native Dakota nation for the Minnesota Territory. The county's history was initially tied to the confluence of the Mississippi and Minnesota Rivers, both strategically important for United States expansion and as the convergence of the Dakota and Ojibwe nations who regarded the site as sacred. Influence shifted westward during the post-World War II settlement boom when Interstate 35 connected the western half of the county to Minneapolis and Saint Paul and bedroom communities grew. Most work outside the county but like many metro counties, Dakota continues to absorb industry and jobs from the core cities. Taoyateduta led the Mendota Mdewakanton in northern Dakota County. He and 121 Sioux leaders ceded much of the present Twin Cities region. In the 1600s, Mdewakanton Dakota fled their ancestral home of Mille Lacs Lake in northern Minnesota in response to westward expansion of the Ojibway nation. According to Dakota tradition, their ancestors pushed out the Iowa who were found settled at the mouth of the Minnesota River. In 1680, the Mdewakanton Dakota were contacted by French explorer Daniel Greysolon, Sieur du Lhut, and the Mendota (mdo-TE) band of the Mdewakanton south of the Minnesota River were contacted by Joseph Nicollet in the 18th century. While Taoyateduta (a.k.a. Little Crow) led the Mendota in northern Dakota County, upstream to the southwest, Chief Black Dog established his village of 600 people around 1750 at the isthmus between Black Dog Lake (which is named after him) and the Minnesota River, near the present site of the Black Dog Power Plant. Following the published expeditions of explorers, in 1805, Zebulon Pike negotiated for military territory with the Mendota band which included land in Dakota County at the Mississippi River confluences with the Minnesota and St. Croix Rivers. In 1819, on what is now Picnic Island on the south bank of the Minnesota River, Colonel Henry Leavenworth built a stockade fort called "St. Peter's Cantonment" or "New Hope," where materials were assembled for the construction of Fort Snelling to be built on the bluff on the north bank. Permanent settlement on the island was impossible due to annual flooding. Alexis Bailey built some log buildings nearby to trade in furs in 1826. Henry Hastings Sibley later built the first stone house in Minnesota in 1836, overlooking Fort Snelling. Sibley was a partner in the American Fur Company, and considerable fur trade occurred at Mendota due to the accessibility of the confluence. Ongoing United States expansion into the then "Northwest Territory" led to government purchase of land from the Dakota people (the Mdewakanton, Wahpekute, Wahpeton, and Sisseton bands) via the Treaty of St. Peters and the Treaty of Traverse des Sioux in 1851. and the Treaty of Mendota. After the Minnesota Territory was established in 1849, Dakotah County (later Dakota County) spanned from the Mississippi River to the Missouri River. By the time Minnesota achieved statehood in 1858, power and influence had shifted from Mendota, across the rivers to Saint Paul and Minneapolis. By 1900, the hub of activity in the county was in Hastings, the county seat, and a focal point of transportation, communication, and commerce. St. Peter's, now Mendota, had lost out to Fort Snelling. Hastings is located on the Mississippi River at the confluence of the St. Croix River and on the Vermillion River, which provided ample water power. Lumber, milling, and railroads provided good incomes. During this time, the stockyards and meat-packing plants in South Saint Paul became the world's largest stockyards. Ranchers in the west shipped their livestock to St. Louis, Memphis, and New Orleans. These plants were worked by immigrants from Romania, Serbia, and other Eastern European countries. The rest of the county remained agricultural during the boom of milling activity north of the Minnesota River due to lack of bridge connections. Rail access came in 1866 via the Chicago, St. Paul, Minneapolis, and Omaha Railroad which shipped grain to millers. The Minneapolis St. Paul Rochester and Dubuque Electric Traction Company line in 1905 (now the Dan Patch Corridor), was primary for passengers going to resorts in Burnsville and Lakeville. By the 1950s, population growth shifted to western Dakota county, which had been predominantly Irish and Scottish extending southward toward the Scandinavians of Southern Minnesota. As population pressures expanded south from Minneapolis and Bloomington, the completion of Interstate 35W and 35E brought about major construction in the post-World War II period, turning villages into cities within 20 years. Burnsville, Apple Valley, Eagan, and Lakeville brought over 200,000 people into the county by the end of the century. The Western and Northern Service Centers were constructed in the early 1990s each with an additional courthouse location. License centers were subsequently set up in Burnsville and Lakeville. Though pressure remained since the postwar boom to move the county seat to a larger community, the Dakota County Board maintained the seat in Hastings, while providing government services across the county. The history of the county is well-illustrated by the Registered Historic Places in the county, including the settlement at Mendota, the homes of well-heeled residents of Hastings, the ethnic gathering places in South Saint Paul, and other sites related to life on the prairie, including religion, education, transportation, commerce, and farm life. Dakota County has an elected Sheriff (Tim Leslie) and an elected County Attorney (James Backstrom). There are appointed boards for the library system, community development agency, and several advisory boards. Dakota County is served by an elected board of the Soil and Water Conservation District. Dakota County voters tend to vote Democratic. Since 1960 the county has selected the Democratic Party candidate in 71% of national elections (as of 2016). The county terrain consists of low rolling hills, sloping to the river valleys. Its highest point is near the SW corner, at 1,037' (316m) ASL. The county has a total area of 587 square miles (1,520 km2), of which 562 square miles (1,460 km2) is land and 25 square miles (65 km2) (4.2%) is water. The northern and eastern boundaries of Dakota County are marked by the Minnesota and Mississippi Rivers. Management and jurisdiction of the rivers falls into multiple local, State and Federal agencies. Most of the Minnesota River bank is under the Minnesota Valley National Wildlife Refuge with fish, wildlife, and parkland managed collectively by the United States Fish and Wildlife Service and the Minnesota Department of Natural Resources. The Dakota County Soil and Water Conservation District assists the county's six watershed management organizations (WMO) which include the Black Dog WMO, Gun Club Lake WMO, Lower Minnesota River Watershed District, Lower Mississippi WMO, North Cannon River WMO, and the Vermillion River Watershed Joint Powers Organization. Mississippi River: Adjacent to Mendota Heights, Lilydale, South St. Paul, Inver Grove Heights, Rosemount, and Hastings. Minnesota River: Adjacent to Burnsville, Eagan, Mendota Heights, and Mendota. Vermillion River: From Farmington through Empire Township to Hastings. Cannon River: Adjacent to Randolph and through Randolph Township. Since the county grew as a bedroom community of Minneapolis and Saint Paul, over half of the residents (54%) work outside the county. According to the 2010 United States Census, Dakota County had a population of 398,552, of which 195,661 (49.1%) were male and 202,891 (50.9%) were female. In terms of age, 76.7% of the population were 16 years and over, 73.6% were 18 years and over, 70.5% were 21 years and over, 12.8% were 62 years and over, and 10.0% were 65 years and over. The median age was 36.8 years. The median age for males was 35.7; the median age for females was 37.9. In terms of race and ethnicity, the county was 85.2% White (82.3% Non-Hispanic White), 4.7% Black or African American, 0.4% American Indian and Alaska Native, 4.4% Asian, 0.1% Native Hawaiian and Other Pacific Islander, 2.4% from some other race, and 2.9% from two or more races. Hispanics and Latinos of any race made up 6.0% of the population. In terms of households, 69.5% were family households and 30.5% were non-family households. Approximately 55.2% were husband-wife family households; 26% had children under 18 years of age. Approximately 36.6% of households had children under 18 years of age living in them; 18.6% had people over the age of 65 living in them. The average household size is 2.60 and the average family size is 3.12. In terms of housing occupancy, 95.3% of households were occupied and 4.7% were vacant. Of the vacant housing units, 2.0% were for rent, 0.1% were rented but not occupied, 1.2% were for sale only, 0.2% were sold but not occupied, 0.5% were for seasonal, recreational, or occasional use, and 0.8% were all other vacants. The homeowner vacancy rate was 1.7% and the rental vacancy rate was 8.1%. Of all occupied housing units, 76.5% were owner-occupied and 23.5% were renter-occupied. The population in owner-occupied units was 314,833; the average household size was 2.71. The population in renter-occupied units was 80,866; the average household size was 2.26. Dakota County is home to the state's largest school districts and some of the highest paid Superintendents. Nationally recognized Independent School District 196 (Rosemount-Apple Valley-Eagan) houses 28,000 and is the fourth largest school district in the state. Other districts include Independent School District 191 (Burnsville–Eagan–Savage School District), Independent School District 194 (Lakeville–Elko–New Market), Independent School District 197 (West St. Paul–Mendota Heights–Eagan) and Independent School District 200 (Hastings). Street in downtown Apple Valley with signature red lamp posts. In the background is the Western Service Center. Dakota County is home to sites significant in the state's early history. At Mendota, the Treaty of Mendota was signed, opening Southern Minnesota to settlement, and prominent Saint Paul businessmen built their mansions there. Though linked with the state's capital for much of history via rail, Dakota County owes much of its current growth to the expansion of Minneapolis' population which accelerated during the post-World War II boom era of the 1960s. This demand for housing along with two major interstate highways linking Minneapolis (I-35W) and St. Paul (I-35E) to the county, concentrated major growth and demand along the northern end. Today, the cities of Burnsville, Eagan, Apple Valley, Lakeville, Rosemount, Hastings, Inver Grove Heights, Mendota Heights, West St. Paul, and South St. Paul are synonymous with the Twin Cities, as being part of "the Cities." Both Burnsville and Eagan are nearly developed and have become more like independent cities attracting major development than mere residential bedroom suburbs. Lakeville's downtown began in the early 20th century, contrasting its modern suburban development. In contrast, the southern part of Dakota County reflects the rural past with small towns such as Farmington, Coates, Vermillion, Hampton, Randolph, and Miesville where street grids and housing dating from the early 20th century can be found. Much of the county is self-contained except for two examples. The City of Hastings, the county seat, lies on both banks of the Mississippi River and was linked historically and physically by rail to the growing influence of the state's capital, Saint Paul. On the south border, the City of Northfield, technically in Rice County, has expanded north into Dakota however the city itself is allowed into the municipal sewer boundary. Though all of Dakota County is considered part of the metropolitan area and open to major development, the county government has steadily preserved farmland and continues to acquire new permanent natural lands in the southern townships. This has further defined the boundaries between urbanized and rural which is starkly visible in the outskirts of the developed cities. While the center of population still lies north with more cosmopolitan residents, culturally Dakota County is a rural community and the Dakota County Fair is still a largely agricultural event, held annually in Farmington. Most of northern Dakota County is referred to as "South of the River" for its location being south of the Minnesota River. ^ a b "County Origin". Dakota County Historical Society. 2005. Archived from the original on May 12, 2008. ^ Charles Dosh (2003–2007). "Dakota County Genealogy". MN Gen Web. ^ Nelson, Steven (2011). Savanna Soils of Minnesota. Minnesota: Self. pp. 43 - 48. ISBN 978-0-615-50320-2. ^ a b Kevin Monroe; Dawn Thongsavath; Heidi Welsch (May 2006). "Public Assistance Caseload, Increase Analysis" (PDF). Dakota County Employment and Economic Assistance. Archived from the original (PDF) on November 28, 2007. Retrieved September 12, 2007. ^ Kappler, Charles J., Washington: Government Printing Office, ed. (1904). "Indian Affairs: Laws and Treaties". II (Treaties, 1778-1883). Oklahoma State University Library. ^ "Treaty with the Sioux". September 29, 1837. Archived from the original on December 1, 2008. ^ "Treaty with the Sioux—Sisseton and Wahpeton Bands". July 23, 1851. ^ "Treaty With the Sioux—Mdewakanton and Wapahkoota Bands". August 5, 1851. Retrieved June 26, 2007. ^ Handbook of American Indians, 1906 (2008). "Iowa Indian Tribe History". Access Genealogy. ^ "Who We Are". Mendota Mdewakanton Dakota Community. 2007. ^ Dakota County Historical Society (2005). "Historic Sites: Burnsville". Archived from the original on December 30, 2003. ^ "Historic Sites:Mendota Heights". Dakota County Historical Society. 2005. Archived from the original on September 28, 2007. Retrieved February 28, 2008. ^ Carley, Kenneth (1976). The Sioux Uprising of 1862. Minnesota Historical Society. ISBN 0-87351-103-4. OCLC 2225048. ^ Lass, William (1998) . Minnesota: A History. New York NY: W. W. Norton & Co. ISBN 0-393-04628-1. OCLC 37527613. ^ Meyer, Roy Willard (1993). History of the Santee Sioux: United States Indian Policy on Trial. Lincoln NE: University of Nebraska Press. ^ Dosh, Charles. "Welcome To Dakota County MN". MN Genweb. Retrieved March 2, 2008. ^ "South St. Paul Riverfront Trail". Mississippi National River and Recreation area. Archived from the original on December 31, 2006. Retrieved March 19, 2007. ^ "County Origin". Dakota County Historical Society. 2005. Archived from the original on May 12, 2008. Retrieved February 28, 2008. ^ "Historic Sites:South St. Paul". Dakota County Historical Society. Archived from the original on August 7, 2008. Retrieved March 19, 2007. ^ ED Neill (1881). "History of Dakota County 1881". Burnsville Heritage Committee. Archived from the original on October 25, 2009. ^ "The Dan Patch railway". St. Louis Park Historical Society. Archived from the original on February 26, 2008. ^ Kevin Gerahty (March 2006). "Histories of the Dakota County Irish". Friends of the Highland Cemetery. ^ Karen Miller (1896). The diary of Karen Miller. s.n. ^ Dan Gearino (August 11, 2000). "County breaks ground on $36.5 million Northern Service Center in West St. Paul". Thisweek Newspapers. Retrieved May 10, 2008. ^ The leading "other" candidate, Progressive Theodore Roosevelt, received 1,608 votes, while Socialist candidate Eugene Debs received 196 votes, Prohibition candidate Eugene Chafin received 87 votes, and Socialist Labor candidate Arthur Reimer received 13 votes. ^ Ripley, George; Dana, Charles A., eds. (1879). "Dakota. IASE county of Minnesota" . The American Cyclopædia. ^ "2010 Census Gazetteer Files". US Census Bureau. August 22, 2012. Archived from the original on September 21, 2013. Retrieved October 15, 2014. ^ Dirk Deyoung (April 24, 1998). "South of the river draws big players". Minneapolis / St. Paul Business Journal. Retrieved June 5, 2008. ^ "Knutson, David L." Minnesota Legislative Reference Library. Retrieved November 2, 2018. Wikimedia Commons has media related to Dakota County, Minnesota. This page was last edited on 4 April 2019, at 22:55 (UTC).